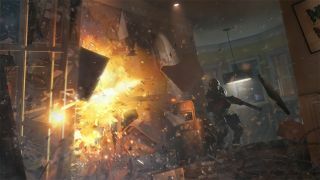 The Rainbow Six Siege gameplay video that debuted at E3 made quite a splash, as hostage-takers and police combined to reduce a nice suburban home into a pile of splinters. It's a level of destruction we haven't seen before, designer Andrew Witts explained in a new Ubiblog post , because the technology to bring it to glorious life wasn't available until now. That extreme destructibility forms the "core" of Rainbow Six Siege, Witts said, and that's a point Ubisoft really wants to hammer home. "We're stressing that as far as we can because it's the center of the experience. The destruction is fully procedural and based on its materials. So when you blow up a wall that's made of wood, it will splinter and break and be cut like a wood wall would be if you put a breach charge on it," he said. "The next-gen destruction system is really what brings us forward as far as gameplay goes." And despite being coy about it in an interview with PC Gamer at E3 , Witts also confirmed that there will be more hostages than just the helpless housewife shown in the trailer. "Of course, it won't only be female hostages. There will be both male and female hostages," he said. "I can't say how many there will be in total, but we will definitely have both." Rainbox Six Siege is currently expected to launch sometime in 2015.